No doubt they are idiots and it's largely because they have zero expertise in the topics they discuss. Whenever a relevant expert hears their talk he has no choice than to either burn his degree or bang his head in the wall. However, we must give credit when it's due! They are not Lifafas at least! But they are dancing to the tune of their employers who were making 245,000 per minute from their faces and now only get 45,000 per minute. Just one break during their show made enough money for the channel to pay both their salaries. Heres another womanizer tucha, yusuf baig, getting close to IK. I dont understand wtf is wrong with IK. کلاسرا ایک خود پرست صحافی ہے دوسروں پر تنقید کرتا ہے لیکن اپنے پر تنقید سن نہیں سکتا بےشرم خود اپنے پروگرامز میں نیٹ فلیکس کے واہیات پروگرامز کا ڈسکسس کرتا ہے. ڈرامے دیکھ کر ارسطو بنا ہوا ہے . c) He is cut-throat --- And probably that's why he has reached in life to this point! In a merit-based system, the smartest of the lot makes to the top. In a jungle system, only cut-throat people grab the top spots! Real revelation was the Zulfi Bukhari Umra incident. He did a solid 2 to 3 weeks of back to back programs on it. Even after Zulfi Bukhari had come on the media and explained everything clearly but he just kept going. One had to wonder if it was some kind of personal grudge or something. 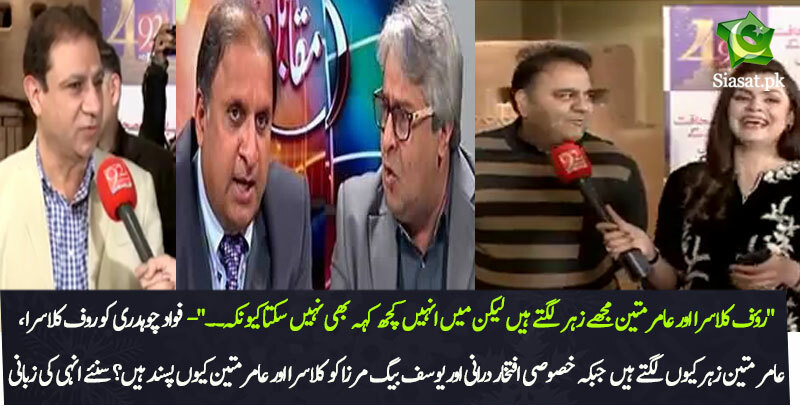 yaar Rauf Klasra......thsi man says he read books which some one bought for him....immagine he cannot buy his books. He also used to meet with PMLn Ministers at home.....Pervaiz Rasheed mentioned to him live that he stopped his house but Rauf Klasra apologized that you missed me........he is typical "Thorey wich bouhat zeyda pey geya ey"